I’ve been standing on the ledge of a pool for the past year. It’s a lively pool party – people are laughing and having fun together and everything points to one thing: the water’s fine. I’ve even dipped my toes in a few times and it feels perfect. So why can’t I just jump in? 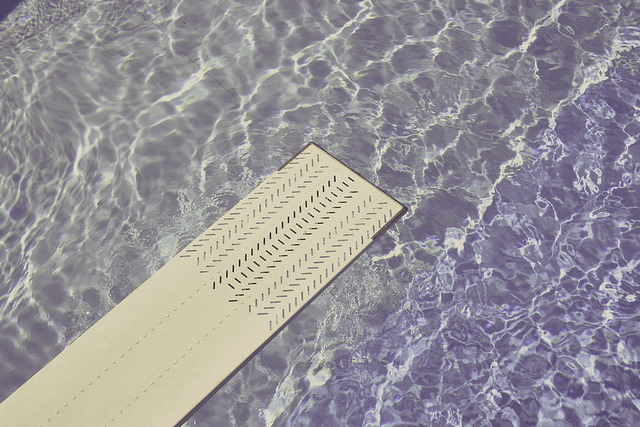 The pool I want to dive into is the simple living, minimalist blogging group that I’ve become familiar with over the past two years. The pool includes a daily writing habit, a weekly posting schedule and intentionally consuming information. It includes larger project ideas like eBooks and real books and the opportunity to someday, somehow get paid for what I love doing most. To me, it sounds lovely. The ledge is where I’ve been at a standstill for the past several months. I’ve kept an erratic blogging schedule, lost my way on nearly every mindfulness practice I’ve set out for myself and honestly, failed every “good writer” habit I’ve tried to develop. I’ve been beating myself up about not always holding up the “practice what you preach” principle. But today I realized that holding on to those missteps and failures is a stupid idea. An almost comically stupid idea. So here it is! It’s time to decide whether to leave the pool party or jump in. And there are a lot of cool people at this pool party, so how would I look and feel if I just left now? I’ve decided to take the jump into prioritizing my blog and my interaction with the community, both online and off. I’m going to jump into personal and professional development and start doing what I love. Heck, I may even cut down on my “real life” work commitments so that I can add more non-monetary value to my life, and hopefully to yours. No worries though, my blog will always remain ad-free and sponsored post-free. One thing I promised myself when I started this blog was that I wouldn’t make it all about me. I wanted to be able to reach out to readers and random internet strangers about how this stuff affects them too. So in writing this post, I realized we all have pools that we’re just dying to jump into. You may have been standing at your ledge for 30 minutes or 30 years, but what matters most is how soon you take that next step. Will it be another 30 minutes? Or another 30 years? I got all my negative thoughts out and then my writing started to shape from whining and excuses to actually encouraging myself to jump in. I was channeling my inner cheerleader (which I never was in real life). It was fun and revelatory. So here’s my challenge to you: find your ledge, but more importantly find your pool. What have you been putting off? You can take a little time to explore the “why not” that’s been holding you back, but I recommend not dwelling too long on it. Dwelling on the “why nots” creates a breeding ground for more “why nots”. And “why nots” are embarrassing and cumbersome to have to carry around at a pool party. So here’s your permission: spend some time free writing, brainstorming or – here’s a novel idea – sit quietly and think about what pool you’ve been meaning to jump into. Find out what’s been hiding below the surface and realize that you’ve already been invited to the party. All you need to do now is show up and get to that ledge. This entry was posted in Mindsets, Productivity and tagged blogging, challenge, change, lifestyle, starting, writing. Bookmark the permalink. The opposite of success isn’t failure. it’s not trying. Love it, what a great reminder. Thanks, Berin! Wow, just what I needed this morning. I am at a major place in my life, with the passing of my husband and trying to decide if I have the courage to make some major changes in my life. Changes that will disappoint some but are true to my authentic self and this minimalism is just that. I keep hearing the words to a song, should I stay or should I go now, hmm. Oh man this is so honest! I felt like I was reading what’s been going on inside my head all the time, I can completely relate to your struggles. Thanks for sharing this, I found it extremely insightful. I’ve got a 5 month old baby and had planned to jump off the ledge when he arrived with all the time I thought I’d have. What a rookie error. Good on you for recognising that it’s time to jump, I’ll follow you as soon as I can! Thanks! That is a really great idea. I need to get a lot better about scheduling stuff in advance – I’m going to be visiting home in the next couple of weeks and so I’m really going to try and schedule posts to go live while I’m hanging with my family 🙂 Thanks for sharing! I am looking forward to you jumping in and all the future blog posts that are in you waiting to come put.